I recently attended a talk given by Professor Alistair Driver, an influential advocate of rewilding in Britain. I’ve written this post to provide a summary of what was said and to debunk some of the common myths which often stigmatise rewilding. Dissecting this definition, by ‘large scale‘, Prof. Driver means at least 10,000 ha in England and Wales and at least 100,000 ha in Scotland. This is the minimum scale he believes true rewilding can operate at as it’s large enough for differences to be measured. It’s also worth paying attention to the implications of ‘towards the point‘. This illustrates that rewilding is an ongoing activity which can take over a century. Prof. Driver was clear that rewilding is not immediate; in fact, it is likely that future generations will be the ones to decide whether or not to continue the legacy and achieve truly rewilded habitats. All we can do is move towards that point! 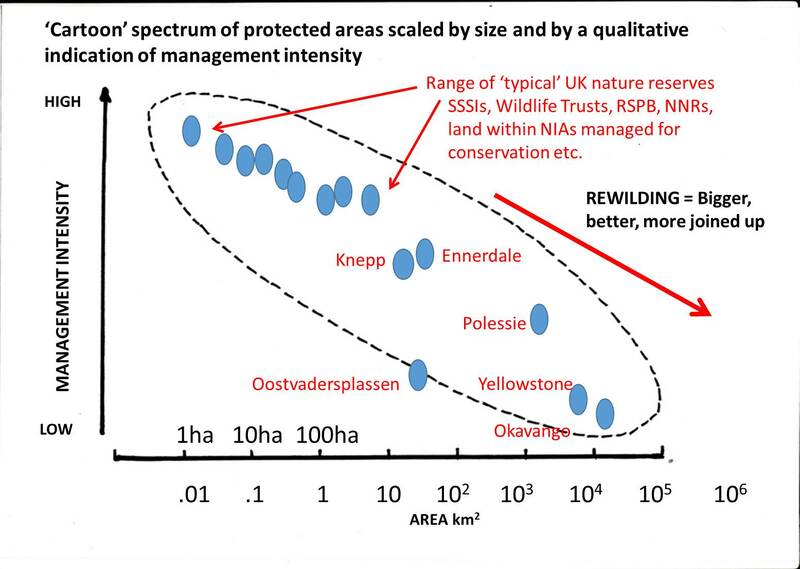 Whilst most nature reserves in the UK are heavily managed and relatively small in size, rewilding aims to have little management after initial interventions over a large area (see graph below). Obviously sites for rewilding in England will not be able to be as large as Yellowstone; Prof. Driver pointed out that in an ideal situation, rewilded sites would be at the same height as Ennerdale but further to the right (ie. as little management as possible, and as large as is feasibly possible). What will rewilding look like? This is very difficult to say as it depends on a multitude of complex factors including the specific location and initial interventions used. Prof. Driver recommended showing examples of ‘before’ and ‘after’ rewilding and the differences are often staggering. He also said that good artist impressions may be of use to illustrate how the landscapes may change. The photos above depict a barren Carrifran in 1999 (left) and against a rewilded Carrifran in 2015 (right). You can read more about this here. What is rewilding NOT about? Wolves and bears in England/Wales; the public simply aren’t ready and there also aren’t the appropriate habitats for them anyway! It is not about Rewilding Britain buying land; existing landowners/organisations need to cooperate and see the benefits rewilding can provide for them. One of the biggest arguments against rewilding is the misconception that agricultural production will be lost entirely; this simply isn’t true. Prof. Driver argued that rewilding should be pragmatic, and farming will continue on rewilded land, it may just be much more extensive. We would naturally have herbivores within our landscapes as they act as both engineering tools and as food. For example, on the Knepp estate, pigs are playing the same role that wild boar historically did, whilst longhorn cattle are playing a different role to the pigs. The Knepp estate has only begun to rewild in the last 10 years, yet they have had profound successes. Furthermore, they are still farming! This is something that must be thought about carefully; which keystone species would we like to see again? Prof. Driver argued that the public in England and Wales aren’t ready for wolf introductions, and I tend to agree; furthermore, we currently just don’t have ample habitat for them. Beavers – there have already been a few, but even Michael Gove is on board with this and apparently wants to be there when they’re released in the forest of Dean! You can read more about the current beaver reintroductions here. Pine Martens – Prof. Driver was confident that these will be reintroduced, partially due to their role in controlling grey squirrels to allow the recolonisation of red squirrels. Read more about this here. Soil is inarguably the biggest elephant in the room at the moment. We are losing it at detrimental rates, and we only have 30-40 years left of fertile soil if current practices continue. Compaction, arable farming on slopes, and soil loss into the sea is literally money down the drain. Prof. Driver argued that we must restore landscapes at a significant scale to ensure we have healthy soil in the future. However, he was optimistic and argued that many soils which others have assumed have ‘no hope’ due to saturation can be recoverable because it’s only the top 1-2 inches that are saturated due to compaction; below that, it’s often completely dry and this CAN be fixed; it just takes time. Prof Driver acknowledged that you cannot sell wildlife and nature on its own merits in order to secure significant government funding; sadly, this just isn’t persuasive enough. Therefore, natural flood management, which can save £millions has become an incredible useful hook to exploit. However, there is still a long way to go, with only £15m currently being spent over 3 years; Prof. Driver argued that this figure should be dramatically higher. Showing the government that intervention can save money appears to be the way forward; after £160m was spent in Somerset on natural flood management, a flood was reduced by 10%, preventing 90 properties from flooding, saving £30m during a 1 in 25 year flood event. A key issue with rewilding is that it MUST have a long term strategy; a 5 year government cycle is not long enough to make a difference. Many argue that our national parks in particular are already ‘wild’; however, our levels of wildness are actually very low. People also argue that places such as the lake district are beautiful as they are and don’t need to change. However, from a naturalist’s perspective, Prof. Driver argued that a lot of it isn’t in particular! Much of the lake district has little texture/colour and actually looks barren; even if it is aesthetically pleasing now, imagine how much MORE beautiful it could be with increased biodiversity (see the photos of Carrifran above)! Actually, no. Prof. Driver argued that bracken grows where trees once were, so the spread of bracken was actually due to deforestation. He maintains that bracken will eventually decline after rewilding. Many people are concerned about ground-nesting birds if more predators are introduced. However, the most common predators, foxes and crows, are only found alongside livestock; without livestock, they will also retreat as they need dung containing invertebrate prey. However, Prof. Driver did recognise that there will inevitably be some losers, and sadly, one of those losers does appear to be the curlew, although he was hopeful that they may recover; they may be simply too far from saving. Nevertheless, with rewilding, there will be an overall increase in biodiversity with other rare species able to recolonise. – No, because depending on the location and various other factors, initial interventions are made before management reduces. Some species are unlikely to be controlled as it’s almost a lost battle anyway (e.g. signal crayfish), but with others it will be possible to control them. – Prof. Driver argued that before worrying about this, we need to stop wasting 25% of food before worrying about a relatively small amount of land becoming slightly less productive. – Firstly, public perception; for now, we may not be able to use the term ‘rewilding’ as it has a certain stigma attached and a lot of misconceptions surround it. Secondly, it mustn’t be forgotten that a farmers’ main motivation is to produce food so the cultural aspect is vital and must not be dismissed. Prof. A. Driver has had an extremely admirable career, working for a whole host of environmental organisations to improve the environment. He is now working for Rewilding Britain, a small catalyst organisation with big ambition. He has been involved in various projects to restore environments including helping to ‘rebend’ the river Cole in the 1990s and creating RSPB wetland at Otmoor, Oxon, both of which have been a success. He has also been involved in targeted species recovery, including otters after many had been rendered infertile after pesticide usage during the 1960s. He previously worked in a senior policy role for the Environment Agency (which sounded like one of his more frustrating roles as the EA are ‘hamstrung by government rules and bureaucracy’). He is also an honorary professor in applied environmental management at the University of Exeter. PS good luck with the PhD. Enjoy the freedom of your research time, it’s a very precious commodity, never to be repeated in later life. Thanks very much for your comment, Steve! Knepp is a lovely example of how rewilding can work, I hope to explore it in the near future. I am thoroughly enjoying the PhD too, although the time is already flying by far too quickly! Are we really sure that England doesn’t have the habitat for wolves? They can live anywhere – moors, mountains and forests and they have been seen in Belgium, having entered Denmark and West Germany. Kielder with its forests and moorland is next to the southern uplands in Scotland where a certain amount of habitat restoration is going on at the moment. Are we really saying there is isn’t enough habitat in the Lakes? The problem in my view is really the use of the land and the predominance of sheep and the cultural hegemony imposed by the farming lobby rather than the absence of habitat per se. I agree with prof Driver who says that people are not yet ready for wolves but further spreads in Europe, if this can occur without undue or unmanageable damage to human interests might help atitudes change. Has the proposal to introduce Lynx been kicked into the long grass? I would have thought a decision would have been made or be imminent. From what you have said there seems to be a hint that this is what has happened. If so I am very disappointed.